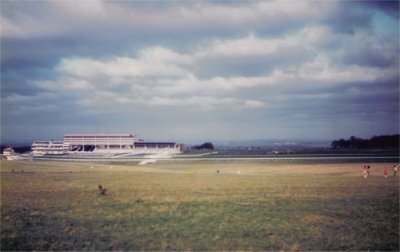 All of Surrey Sounds broadcasts were from a permantly installed antenna on a randomly selected tree in the middle of Epsom Downs forest on the opposite side to the grandstand. The view from ground level was almost as impressive as that from the top of the tree. 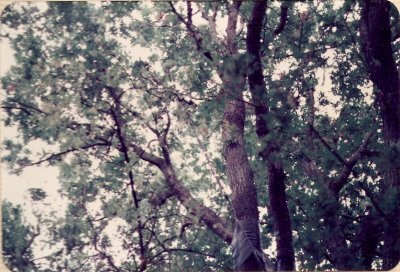 Dave the engineer was assigned to climb the tree and to make final adjustments of the 28ft mast at night and in the rain. The omni-directional aerial was arranged to be exposed above the tree line to minimise interference and to provide a clear view of London and the North Downs. 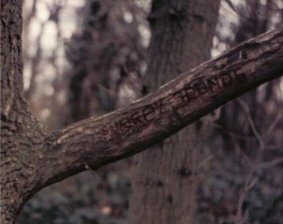 A low loss coax was then used to connect to the transmitter at the base of the tree. 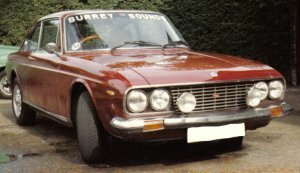 A daring attempt to make Surrey Sounds mobile in North Surrey used the Lancia below and a roof mounted magmount 1/4wave aerial. The broadcast started in Weybridge, passed through Molesey and the headed up to Epsom Downs via the A3.